I may have touched on this before, but it bears repeating: Bogof (Buy One Get One Free) deals are the enemy of the single cook. They should be resisted, with force if necessary and it’s time we took the purveyors of this evil tool of the market to task. I’m seriously considering a strongly worded email to Wholefoods Kensington for their latest crime against food waste… more of which momentarily. Why do I hate BOGOF so much? Well, we solo cooks are often more thrifty than our cohabiting brethren. Living alone is exponentially more expensive than shacking up. I’m always on the look out for a bargain. The “buy one get one free” may be ideal for families of 4 and up, but generally results in primordial soup in the salad drawers of Bridgets the length and breadth of the UK. Last Sunday I’d been given a dozen fresh eggs by a dear chicken owning friend. 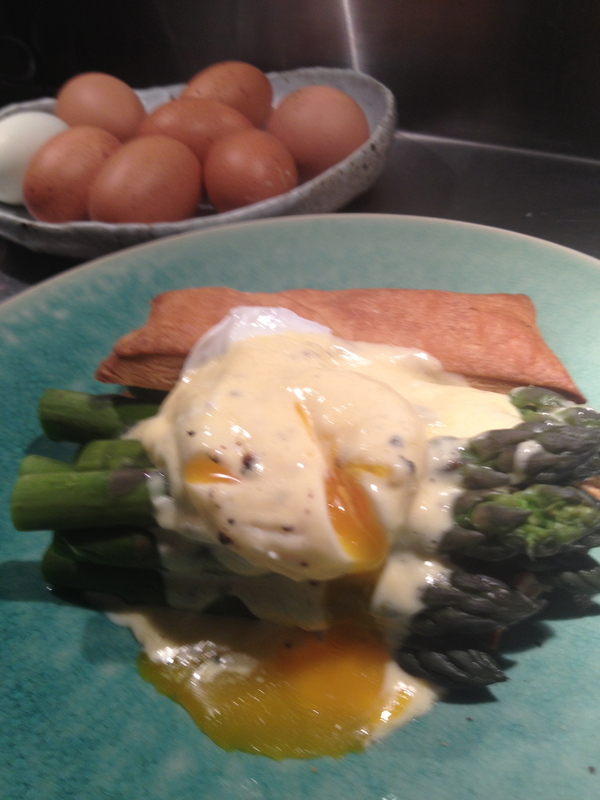 It resulted in a yearning for some asparagus topped with a perfect poached egg. It was late and Wholefoods Kensington seemed like as good a place as any to source some English asparagus on the Sabbath. Why not give me one bunch for £2.50 or even more radically, one bunch for £2.50 and a voucher for another at the same price next week. This lack of imagination in marketing really drives me crazy and insults my intelligence. And of course, you can guess what I did…I bought the two bunches. One did end up lovingly draped with a poached egg, some fresh Hollandaise and a croute of puff pastry left over from a tart. The rest languished until today albeit in the singletons secret weapon, the Lakeland Stay-Fresh bag. Which is how I came to make a risotto this lunchtime. The asparagus wasn’t quite good enough to be naked, but by tomorrow it would have been soup and another day would have seen it in the bin. Which is where an estimated 30% of all fresh vegetables end up every week. I wasn’t particularly in a hurry but was pretty hungry so decided to try making it in my pressure cooker as advised by Catherine Phipps in her book. I wasn’t convinced I would like it, but it was a huge success. Creamy, quick and a great flavour in a quarter of the time it would normally take. To be honest, there’s a lot of guff talked about making risotto. As with most things, it owes a lot to good ingredients and a little to technique. I am a devotee of Acquerello rice. I love the bite and the slightly aged taste. I use a shallot to avoid having too many half onions in the fridge, and vermouth to add a herbiness to the winey back note. 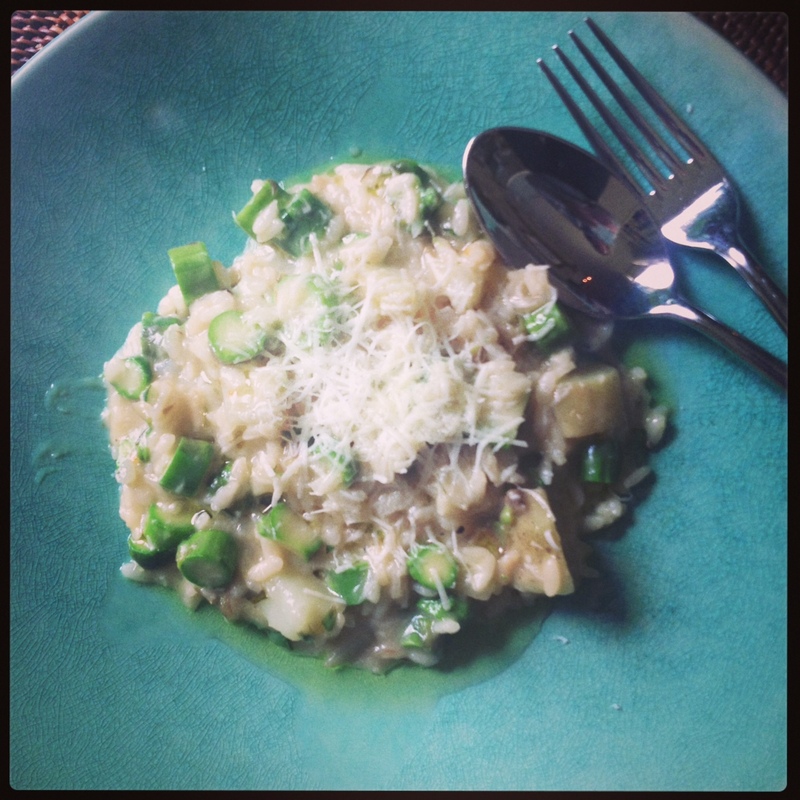 …and for those who think the idea of potato in risotto is a bit ‘starch-on-starch’ yucky…it’s is a thing. And it works. Really. I happened to have some leftover in the fridge, but it’s worth cooking up a few to make this a more substantial meal. Melt the butter in a heavy pan and soften the shallot for a minute. Don’t let it colour. Add the rice and increase the heat a little. Stir and allow the rice to turn a gentle golden colour. Now add the vermouth and allow to almost evaporate as you stir. Next, add the hot stock either in thirds stirring until absorbed before adding the next third. Or if using a pressure cooker, add almost all the stock and cook at full pressure for 5 minutes. Depressurise quickly. Open the PC and stir in the remaining liquid along with the asparagus and potatoes. Stir for 2 minutes and taste. Season and add the pecorino and a little torn tarragon if using. Serve immediately with a drizzle of olive oil if you wish. When I was teaching cooking in Italy one of the men who owned the estate came into the kitchen as I was making a risotto and boldly took over the demonstration ! I remember both my shock at his boldness and his insistence that you should stir a risotto gently and constantly ” As you would caress your lover” I’m not sure of the pressure cooker equivalent . I’ve heard it all too…but Marchesi added most of the liquid at once and let it sit at a medium heat….a vigorous stir at the end seemed to release enough starch to create the creamy finish. Then he took it off the heat, gently laid the butter and cheese on top to melt, covered and left it for 3-4 minutes before stirring again. I was honestly surprised that the pressure cooker method worked so well. But the grains stayed beautifully separate and the finish after a good stir was perfect. It might not be the way I make it every time, but for me on my home with no patience, it was great.